Catholics and non-Catholics come together from different dioceses across the country. Cards Malcolm Ranjith and Bernard Francis Law, archpriest at Rome’s Santa Maria Maggiore Basilica, performed the liturgy. Tewatta (AsiaNews) – “Only Jesus is our answer. Only Jesus can heal our mental and physical ailments. As Catholics, always seek the sacraments of confession and communion! They are the privileges, God gave us,” said Card Malcolm Ranjith, archbishop of Colombo, in his homily to thousands disabled people, both Catholic and non-Catholic, who attended the blessing of the sick. 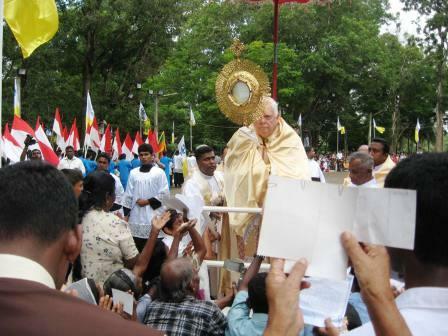 Card Bernard Francis Law, archpriest at Rome’s Santa Maria Maggiore Basilica, Archbishop Joseph Spiteri, papal nuncio to Sri Lanka, took part on Sunday in the Eucharist at Our Lady of Lanka shrine, Tewatta National Basilica. In a solemn procession, participants carried lamps, candles and coloured banners with quotes from the Bible in Sinhalese, Tamil and English. After participating in last year’s blessing, a Buddhist man was healed from long-standing pain to his back and left leg. This year he was back with his family to express his gratitude. “I am happy to see such a large crowd,” said Fr Priya Jayamanne, who is in charge of the Tewatta National Basilica. People are “coming to pray so that Jesus can intercede on their behalf and heal their problems and illnesses. We prepared 600 chairs for special cases, but we had more than 600 patients,” he said. The clergyman is also grateful to the government for providing water, electricity and health facilities needed for so many people.